Freckled Chinese Zara Model Sparks Debate About Beauty Standards In China : Goats and Soda Her unretouched face set off a heated debate about beauty standards — and whether freckles are uglifying. 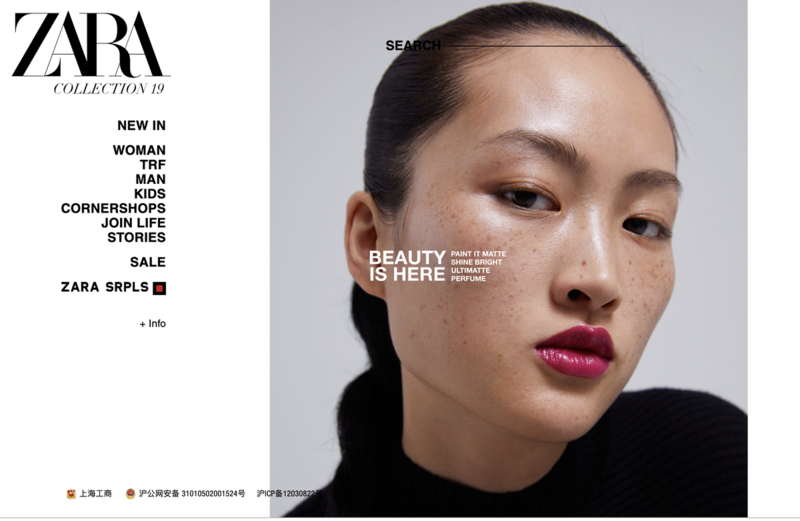 The freckles on the face of model Li Jingwen, visible on this digital ad for Zara, started a conversation on Chinese social media that had 500 million views. A makeup ad campaign featuring a freckled Chinese model has sparked a debate about beauty standards in China. In a lipstick advertisement from the Spanish fashion brand Zara, launched on Weibo, the Chinese equivalent of Twitter, on Feb. 15, a 25-year-old Chinese model named Li Jingwen shows her unretouched face with minimal makeup and red lips. But it's not the striking shades of her lipstick that caught people's attention. On social media, people took offense at the freckled face because it did not reflect Chinese standards of beauty. The images launched a conversation that was eventually viewed a half-billion times. "Are you trying to uglify Asians?" said a user on Weibo. "Sorry, we Asian women don't have freckles. Only a few of us do," commented another on Chinese social media. In China, many consider a woman to be beautiful if she has a small face, pale skin tone, double eyelids, a high nose bridge and a pointy chin (check Chinese actress Fan Bingbing as a reference). Freckles, spots and other blemishes are not acceptable. So what do Chinese women do if they have freckles or spots? Some pin their hope on whitening skin care products, while others splash a few thousand dollars on spot-removal surgery. For those who can't afford either option, China has apps like Meitu, which allows users to wipe out freckles on selfies, for example, before sharing them on social media. The app boasts almost 500 million active users. Seeing the controversies online, Zara posted a response on PearVideo, a Chinese short video platform, saying that the campaign was meant for global markets and not just China: "It's our headquarters in Spain that picked the model. They might have a different beauty standard. ... And we didn't photoshop the photos." The topic on Weibo with the hashtag "Zara responds to uglifying Chinese model" has been viewed 510 million times so far. Not every Chinese netizen sees the Zara campaign as offensive. "What? I didn't know my freckled face is an insult to China," joked a netizen. "You don't think she's pretty?" said one. "Everyone has a different beauty standard. So, you prefer a wanghong lian [an Internet celebrity face, implying a face that has gone through plastic surgery]? Her confidence is beautiful." "Being overly sensitive is what uglifies the country," another commented. State media like China Daily weighed in too. It said that those who see the campaign as "defaming the Chinese" are overly sensitive — and lack "cultural confidence." In recent years, international brands have faced a backlash in the world's second-largest economy when they've done things considered offensive to the Chinese. Last year, Italian luxury brand Dolce & Gabbana's tone-deaf chopstick campaign caused public outrage in China, sparking a boycott of the brand in the country.